Real Traditional Irish Cooking: Irish Teatime Cookbook- new edition Soon !! 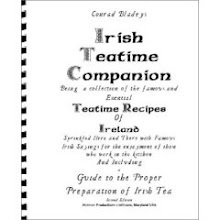 Irish Teatime Cookbook- new edition Soon !! A great collection of Authentic, Traditional REAL Irish tea time recipes will come out in a new edition- perfect bound, and lots of new recipes. Watch this space. The last two printings sold out right away! Probably out by mid September.